And maybe your bad odour worries as well. The device that will solve all your body odour woes (possibly). WEARABLE FITNESS DEVICES are growing in popularity, but one problem when exercising is you’re going to sweat. And from that, you’re going to emit the type of body odour that would probably knock someone out. Well, Google has been thinking a step ahead and could solve that problem for you if its latest patent is anything to go by. 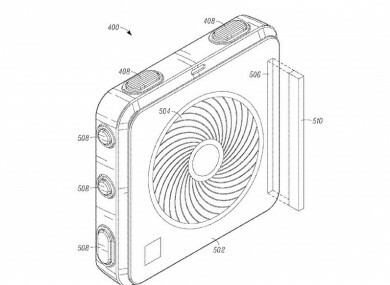 It was granted a patent which describes a device that will sense and remove any bad odours you may have. The wearable device has an activity sensor and is designed around physical activity, but it can also be used for situations which could be deemed stressful like giving a presentation. When the device is able to determine that you’re engaged in a physical activity, it alerts a predictor within it and determines when you will generate body odour in the future. It then alerts you as to when this will happen, in case you want to reject the fragrance. If not, it will apply it at that time. When a user is wearing the fragrance emission device and begins to exert himself or herself, an activity module within the device may detect the physical exertion. The activity module may detect a rise in sweat levels, an increase in body odour or body temperature, or any other parameter that may indicate the user is exercising or otherwise exerting themself (sic). It also says it will connect to your contacts and help alert you to any friends who are within the vicinity. With that info, it can tell suggest an alternative route so you don’t run into them, in case your body odour is really bad and you want to avoid reactions like this. Until then, you probably shouldn’t rule out the shower just yet. Email “Google has a patent that will remove any bad smells from you”. Feedback on “Google has a patent that will remove any bad smells from you”.